These industry standard, 30 DRAM pop top containers adhere to strict quality ASTM standards, CPSC compliance regulations, BPA free and made of FDA approved material. 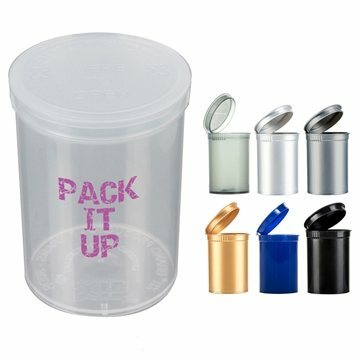 They are child resistant, medical grade and offer the most convenient way to store medical and recreational marijuana. To open the bottles, firmly squeeze on both sides and the lid will come off with a "pop" sound. They are available in opaque or translucent colors and will be sure to impress at health centers, cannabis conventions, head shops, dispensaries, weed industry fairs and more! Fits approximately 7 grams of material. Excellent! work well, and looked great. the quality of the product for the price... nothing was bad about it. Excellent. Got wonderful comments on how great they look! The imprint was detailed and legible. the method in which Alicia suggested options for imprinting the logo. Order came rapidly and was precisely what I purchased. Clever design at a good price. Happy with customer service- very prompt in answering my questions and concerns.